My daughter, who is studying abroad for the year, recently returned from a trip to Poland. Prior to going, she spent some time learning about the Jewish history of the areas she was going to visit, the life that was there both before and during World War II. She even emailed me before she left asking for some family history so she could relate to the cities and graveyards that she was going to see. I never went to Poland, but I have seen pictures of high school students on The March of the Living or on Heritage Seminars. The pictures all look the same. 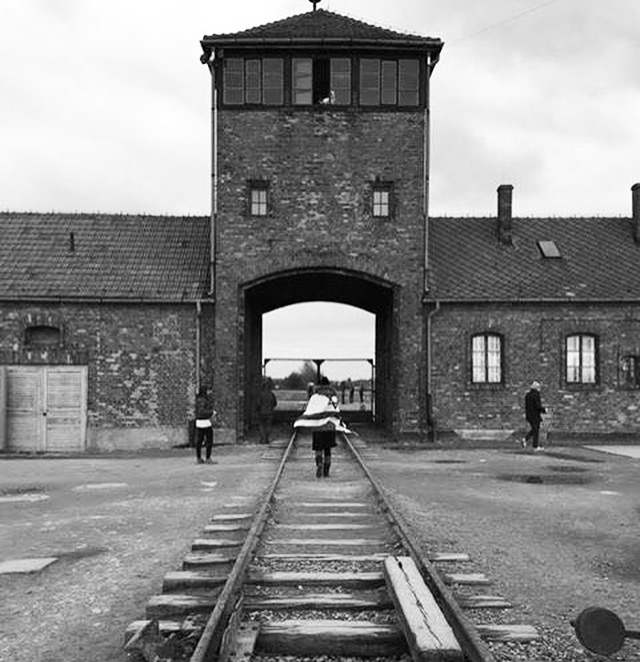 Kids in front of Auschwitz. Kids at Majdanek. 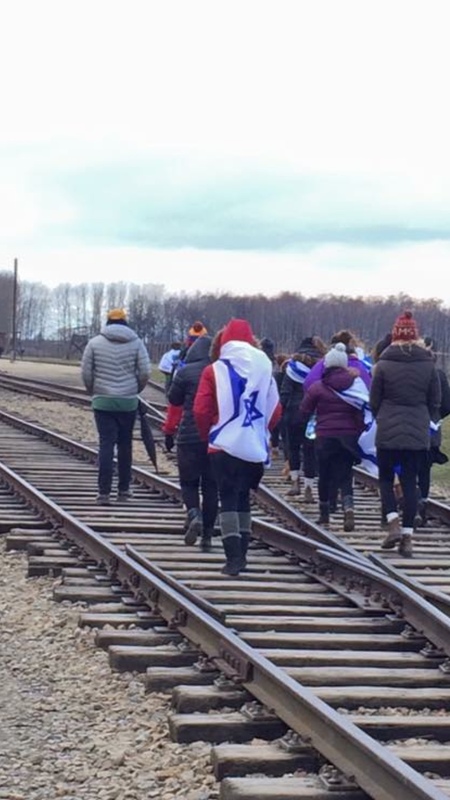 There is always the shot of a student draped in an Israeli flag, back to the camera, walking with friends along the train tracks leading to Auschwitz. “You need to take that picture,” I told my daughter and she immediately knew which one I was talking about. But she really didn’t want to. Too cliched. Too overdone. But then, a few days into her trip, she sent me the picture I wanted. 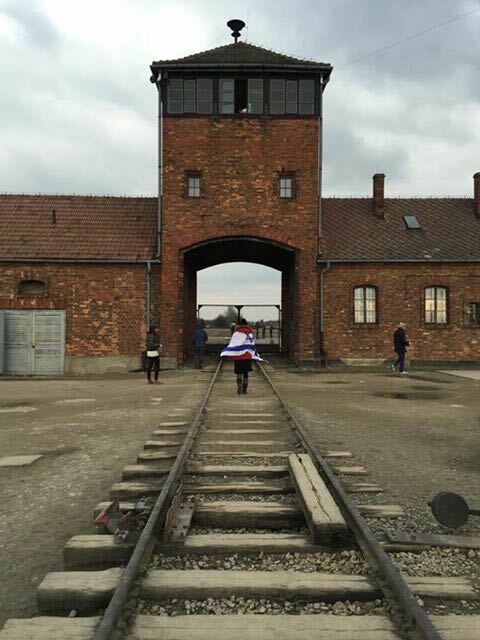 There she was, draped in an Israeli flag, walking along the train tracks to Auschwitz. It was the overdone, over exposed shot. And it left me breathless. Because even though I had seen that set up so many times, I wasn’t prepared for the emotional punch of seeing my own kid in that place. 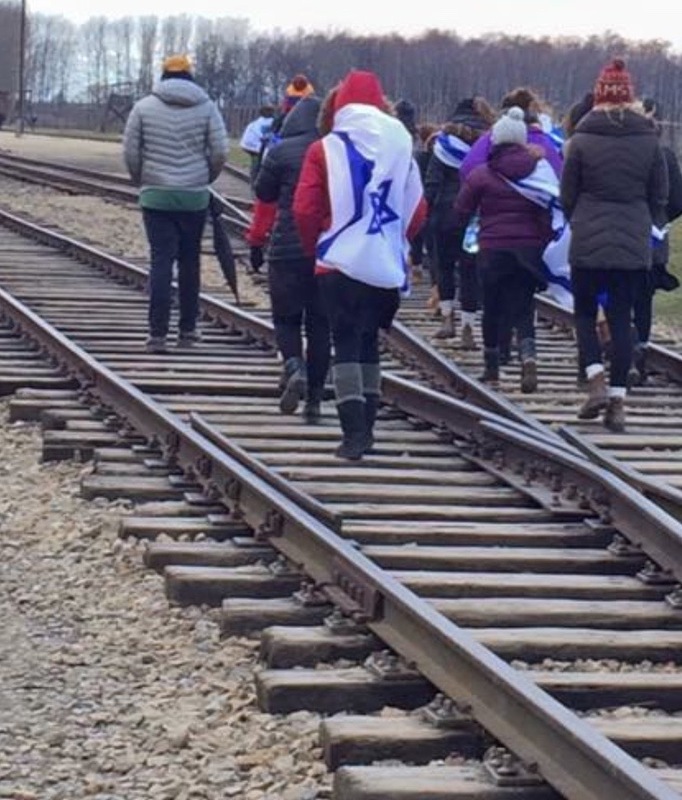 Walking on train tracks that led millions to their deaths. Walking through rooms that might have housed the last moments of my ancestors. And there she was, 19 years old, dressed in a red coat and wrapped in an Israeli flag, marching through those gates. Free, vibrant, alive. The cliched picture that we had joked about became a powerful symbol for me. A visual of family tradition, a representation of all that was lost in the Holocaust, an image of strength and endurance. I had seen that picture so many times, but knowing it was her, my daughter, put an entirely new spin on it. I imagined people walking beside her, silently watching this strong Jewish woman. She is ready to take on the world, sure and confident. It reminded me of what was lost. Of the millions who were just like her so many years ago, walking through those gates, with no option of leaving. It was a picture that cried out the heavy responsibility she has as a member of the Jewish people, as a moral, upright person in the world, and as my daughter, a link in our personal family chain. I called her up soon after I saw the picture. I told her how awesome it was. And we laughed and spoke about the food and how tired she was. When I hung up, I said a silent prayer that she is kept safe and happy. And I swear, I was sure I heard distant voices joining in. She will look back on it and be happy you insisted. It was not a simple photo op. It’s amazing that you so beautifully expressed the exact way I felt when I saw my daughter in the same “cliched” pose. You’re writing always gives me goosebumps!